Nicastro, G., Habeck, M., Masino, L., Svergun, DI., Pastore, A. The availability of new and fast tools in structure determination has led to a more than exponential growth of the number of structures solved per year. It is therefore increasingly essential to assess the accuracy of the new structures by reliable approaches able to assist validation. Here, we discuss a specific example in which the use of different complementary techniques, which include Bayesian methods and small angle scattering, resulted essential for validating the two currently available structures of the Josephin domain of ataxin-3, a protein involved in the ubiquitin/proteasome pathway and responsible for neurodegenerative spinocerebellar ataxia of type 3. Taken together, our results demonstrate that only one of the two structures is compatible with the experimental information. Based on the high precision of our refined structure, we show that Josephin contains an open cleft which could be directly implicated in the interaction with polyubiquitin chains and other partners. Volterra and Wiener series are perhaps the best understood nonlinear system representations in signal processing. 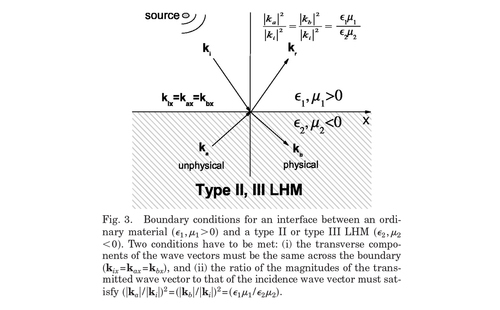 Although both approaches have enjoyed a certain popularity in the past, their application has been limited to rather low-dimensional and weakly nonlinear systems due to the exponential growth of the number of terms that have to be estimated. We show that Volterra and Wiener series can be represented implicitly as elements of a reproducing kernel Hilbert space by utilizing polynomial kernels. The estimation complexity of the implicit representation is linear in the input dimensionality and independent of the degree of nonlinearity. Experiments show performance advantages in terms of convergence, interpretability, and system sizes that can be handled. A common approach for the determination of Slow Crack Growth (SCG) parameters are the static and dynamic loading method. Since materials with small Weibull module show a large variability in strength, a correct statistical analysis of the data is indispensable. In this work we propose the use of the Maximum Likelihood method and a Baysian analysis, which, in contrast to the standard procedures, take into account that failure strengths are Weibull distributed. The analysis provides estimates for the SCG parameters, the Weibull module, and the corresponding confidence intervals and overcomes the necessity of manual differentiation between inert and fatigue strength data. We compare the methods to a Least Squares approach, which can be considered the standard procedure. The results for dynamic loading data from the glass sealing of MEMS devices show that the assumptions inherent to the standard approach lead to significantly different estimates. Hamada, M., Tsuda, K., Kudo, T., Kin, T., Asai, K.
Motivation: In detection of non-coding RNAs, it is often necessary to identify the secondary structure motifs from a set of putative RNA sequences. Most of the existing algorithms aim to provide the best motif or few good motifs, but biologists often need to inspect all the possible motifs thoroughly. Results: Our method RNAmine employs a graph theoretic representation of RNA sequences, and detects all the possible motifs exhaustively using a graph mining algorithm. The motif detection problem boils down to finding frequently appearing patterns in a set of directed and labeled graphs. In the tasks of common secondary structure prediction and local motif detection from long sequences, our method performed favorably both in accuracy and in efficiency with the state-of-the-art methods such as CMFinder. Aigner, T., Fundel, K., Saas, J., Gebhard, P., Haag, J., Weiss, T., Zien, A., Obermayr, F., Zimmer, R., Bartnik, E.
Objective. Despite many research efforts in recent decades, the major pathogenetic mechanisms of osteo- arthritis (OA), including gene alterations occurring during OA cartilage degeneration, are poorly under- stood, and there is no disease-modifying treatment approach. The present study was therefore initiated in order to identify differentially expressed disease-related genes and potential therapeutic targets. Methods. This investigation consisted of a large gene expression profiling study performed based on 78 normal and disease samples, using a custom-made complementar y DNA array covering &gt;4,000 genes. Results. Many differentially expressed genes were identified, including the expected up-regulation of ana- bolic and catabolic matrix genes. In particular, the down-regulation of important oxidative defense genes, i.e., the genes for superoxide dismutases 2 and 3 and glutathione peroxidase 3, was prominent. This indicates that continuous oxidative stress to the cells and the matrix is one major underlying pathogenetic mecha- nism in OA. Also, genes that are involved in the phenot ypic stabilit y of cells, a feature that is greatly reduced in OA cartilage, appeared to be suppressed. Conclusion. Our findings provide a reference data set on gene alterations in OA cartilage and, importantly, indicate major mechanisms underlying central cell bio- logic alterations that occur during the OA disease process. These results identify molecular targets that can be further investigated in the search for therapeutic interventions. Walder, C., Schölkopf, B., Chapelle, O. We consider the problem of constructing a globally smooth analytic function that represents a surface implicitly by way of its zero set, given sample points with surface normal vectors. The contributions of the paper include a novel means of regularising multi-scale compactly supported basis functions that leads to the desirable interpolation properties previously only associated with fully supported bases. We also provide a regularisation framework for simpler and more direct treatment of surface normals, along with a corresponding generalisation of the representer theorem lying at the core of kernel-based machine learning methods. We demonstrate the techniques on 3D problems of up to 14 million data points, as well as 4D time series data and four-dimensional interpolation between three-dimensional shapes. Davy, M., Desobry, F., Gretton, A., Doncarli, C.
The ability to detect online abnormal events in signals is essential in many real-world Signal Processing applications. Previous algorithms require an explicit signal statistical model, and interpret abnormal events as statistical model abrupt changes. Corresponding implementation relies on maximum likelihood or on Bayes estimation theory with generally excellent performance. However, there are numerous cases where a robust and tractable model cannot be obtained, and model-free approaches need to be considered. In this paper, we investigate a machine learning, descriptor-based approach that does not require an explicit descriptors statistical model, based on Support Vector novelty detection. A sequential optimization algorithm is introduced. Theoretical considerations as well as simulations on real signals demonstrate its practical efficiency. Borgwardt, K., Gretton, A., Rasch, M., Kriegel, H., Schölkopf, B., Smola, A. Motivation: Many problems in data integration in bioinformatics can be posed as one common question: Are two sets of observations generated by the same distribution? We propose a kernel-based statistical test for this problem, based on the fact that two distributions are different if and only if there exists at least one function having different expectation on the two distributions. Consequently we use the maximum discrepancy between function means as the basis of a test statistic. The Maximum Mean Discrepancy (MMD) can take advantage of the kernel trick, which allows us to apply it not only to vectors, but strings, sequences, graphs, and other common structured data types arising in molecular biology. Results: We study the practical feasibility of an MMD-based test on three central data integration tasks: Testing cross-platform comparability of microarray data, cancer diagnosis, and data-content based schema matching for two different protein function classification schemas. In all of these experiments, including high-dimensional ones, MMD is very accurate in finding samples that were generated from the same distribution, and outperforms its best competitors. Conclusions: We have defined a novel statistical test of whether two samples are from the same distribution, compatible with both multivariate and structured data, that is fast, easy to implement, and works well, as confirmed by our experiments. Keerthi, S., Chapelle, O., DeCoste, D.
Support vector machines (SVMs), though accurate, are not preferred in applications requiring great classification speed, due to the number of support vectors being large. To overcome this problem we devise a primal method with the following properties: (1) it decouples the idea of basis functions from the concept of support vectors; (2) it greedily finds a set of kernel basis functions of a specified maximum size ($dmax$) to approximate the SVM primal cost function well; (3) it is efficient and roughly scales as $O(ndmax^2)$ where $n$ is the number of training examples; and, (4) the number of basis functions it requires to achieve an accuracy close to the SVM accuracy is usually far less than the number of SVM support vectors. Sonnenburg, S., Zien, A., Rätsch, G.
Sonnenburg, S., Rätsch, G., Schäfer, C., Schölkopf, B. While classical kernel-based learning algorithms are based on a single kernel, in practice it is often desirable to use multiple kernels. Lanckriet et al. (2004) considered conic combinations of kernel matrices for classification, leading to a convex quadratically constrained quadratic program. We show that it can be rewritten as a semi-infinite linear program that can be efficiently solved by recycling the standard SVM implementations. Moreover, we generalize the formulation and our method to a larger class of problems, including regression and one-class classification. Experimental results show that the proposed algorithm works for hundred thousands of examples or hundreds of kernels to be combined, and helps for automatic model selection, improving the interpretability of the learning result. In a second part we discuss general speed up mechanism for SVMs, especially when used with sparse feature maps as appear for string kernels, allowing us to train a string kernel SVM on a 10 million real-world splice data set from computational biology. We integrated multiple kernel learning in our machine learning toolbox SHOGUN for which the source code is publicly available at http://www.fml.tuebingen.mpg.de/raetsch/projects/shogun. Factorial coding of natural images: how effective are linear models in removing higher-order dependencies? The performance of unsupervised learning models for natural images is evaluated quantitatively by means of information theory. We estimate the gain in statistical independence (the multi-information reduction) achieved with independent component analysis (ICA), principal component analysis (PCA), zero-phase whitening, and predictive coding. Predictive coding is translated into the transform coding framework, where it can be characterized by the constraint of a triangular filter matrix. A randomly sampled whitening basis and the Haar wavelet are included into the comparison as well. The comparison of all these methods is carried out for different patch sizes, ranging from 2x2 to 16x16 pixels. In spite of large differences in the shape of the basis functions, we find only small differences in the multi-information between all decorrelation transforms (5% or less) for all patch sizes. Among the second-order methods, PCA is optimal for small patch sizes and predictive coding performs best for large patch sizes. The extra gain achieved with ICA is always less than 2%. In conclusion, the `edge filters&amp;amp;amp;amp;lsquo; found with ICA lead only to a surprisingly small improvement in terms of its actual objective. Hill, N., Lal, T., Schröder, M., Hinterberger, T., Wilhelm, B., Nijboer, F., Mochty, U., Widman, G., Elger, C., Schölkopf, B., Kübler, A., Birbaumer, N.
We summarize results from a series of related studies that aim to develop a motor-imagery-based brain-computer interface using a single recording session of EEG or ECoG signals for each subject. We apply the same experimental and analytical methods to 11 non-paralysed subjects (8 EEG, 3 ECoG), and to 5 paralysed subjects (4 EEG, 1 ECoG) who had been unable to communicate for some time. While it was relatively easy to obtain classifiable signals quickly from most of the non-paralysed subjects, it proved impossible to classify the signals obtained from the paralysed patients by the same methods. This highlights the fact that though certain BCI paradigms may work well with healthy subjects, this does not necessarily indicate success with the target user group. We outline possible reasons for this failure to transfer. Tabei, Y., Tsuda, K., Kin, T., Asai, K.
The functions of non-coding RNAs are strongly related to their secondary structures, but it is known that a secondary structure prediction of a single sequence is not reliable. Therefore, we have to collect similar RNA sequences with a common secondary structure for the analyses of a new non-coding RNA without knowing the exact secondary structure itself. Therefore, the sequence comparison in searching similar RNAs should consider not only their sequence similarities but their potential secondary structures. Sankoff&amp;lsquo;s algorithm predicts the common secondary structures of the sequences, but it is computationally too expensive to apply to large-scale analyses. Because we often want to compare a large number of cDNA sequences or to search similar RNAs in the whole genome sequences, much faster algorithms are required. We propose a new method of comparing RNA sequences based on the structural alignments of the fixed-length fragments of the stem candidates. The implemented software, SCARNA (Stem Candidate Aligner for RNAs), is fast enough to apply to the long sequences in the large-scale analyses. The accuracy of the alignments is better or comparable to the much slower existing algorithms. Gretton, A., Belitski, A., Murayama, Y., Schölkopf, B., Logothetis, N.
Wichmann, F., Braun, D., Gegenfurtner, K.
We measured the effect of global phase manipulations on a rapid animal categorization task. The Fourier spectra of our images of natural scenes were manipulated by adding zero-mean random phase noise at all spatial frequencies. The phase noise was the independent variable, uniformly and symmetrically distributed between 0 degree and ±180 degrees. Subjects were remarkably resistant to phase noise. Even with ±120 degree phase noise subjects were still performing at 75% correct. The high resistance of the subjects animal categorization rate to phase noise suggests that the visual system is highly robust to such random image changes. The proportion of correct answers closely followed the correlation between original and the phase noise-distorted images. Animal detection rate was higher when the same task was performed with contrast reduced versions of the same natural images, at contrasts where the contrast reduction mimicked that resulting from our phase randomization. Since the subjects categorization rate was better in the contrast experiment, reduction of local contrast alone cannot explain the performance in the phase noise experiment. This result obtained with natural images differs from those obtained for simple sinusoidal stimuli were performance changes due to phase changes are attributed to local contrast changes only. Thus the global phasechange accompanying disruption of image structure such as edges and object boundaries at different spatial scales reduces object classification over and above the performance deficit resulting from reducing contrast. Additional colour information improves the categorization performance by 2 %. Wu, M., Schölkopf, B., BakIr, G.
Blanchard, G., Bousquet, O., Zwald, L.
We study the properties of the eigenvalues of Gram matrices in a non-asymptotic setting. Using local Rademacher averages, we provide data-dependent and tight bounds for their convergence towards eigenvalues of the corresponding kernel operator. We perform these computations in a functional analytic framework which allows to deal implicitly with reproducing kernel Hilbert spaces of infinite dimension. This can have applications to various kernel algorithms, such as Support Vector Machines (SVM). We focus on Kernel Principal Component Analysis (KPCA) and, using such techniques, we obtain sharp excess risk bounds for the reconstruction error. In these bounds, the dependence on the decay of the spectrum and on the closeness of successive eigenvalues is made explicit. Kato, T., Murata, Y., Miura, K., Asai, K., Horton, P., Tsuda, K., Fujibuchi, W.
Prediction of human cell response to anti-cancer drugs (compounds) from microarray data is a challenging problem, due to the noise properties of microarrays as well as the high variance of living cell responses to drugs. Hence there is a strong need for more practical and robust methods than standard methods for real-value prediction. We devised an extended version of the off-subspace noise-reduction (de-noising) method to incorporate heterogeneous network data such as sequence similarity or protein-protein interactions into a single framework. Using that method, we first de-noise the gene expression data for training and test data and also the drug-response data for training data. Then we predict the unknown responses of each drug from the de-noised input data. For ascertaining whether de-noising improves prediction or not, we carry out 12-fold cross-validation for assessment of the prediction performance. We use the Pearson‘s correlation coefficient between the true and predicted respon se values as the prediction performance. De-noising improves the prediction performance for 65% of drugs. Furthermore, we found that this noise reduction method is robust and effective even when a large amount of artificial noise is added to the input data. We found that our extended off-subspace noise-reduction method combining heterogeneous biological data is successful and quite useful to improve prediction of human cell cancer drug responses from microarray data. Pfingsten, T., Herrmann, D., Rasmussen, C.
Fluctuations are inherent to any fabrication process. Integrated circuits and micro-electro-mechanical systems are particularly affected by these variations, and due to high quality requirements the effect on the devices performance has to be understood quantitatively. In recent years it has become possible to model the performance of such complex systems on the basis of design specifications, and model-based Sensitivity Analysis has made its way into industrial engineering. We show how an efficient Bayesian approach, using a Gaussian process prior, can replace the commonly used brute-force Monte Carlo scheme, making it possible to apply the analysis to computationally costly models. We introduce a number of global, statistically justified sensitivity measures for design analysis and optimization. Two models of integrated systems serve us as case studies to introduce the analysis and to assess its convergence properties. We show that the Bayesian Monte Carlo scheme can save costly simulation runs and can ensure a reliable accuracy of the analysis. Habeck, M., Rieping, W., Nilges, M.
The determination of macromolecular structures requires weighting of experimental evidence relative to prior physical information. Although it can critically affect the quality of the calculated structures, experimental data are routinely weighted on an empirical basis. At present, cross-validation is the most rigorous method to determine the best weight. We describe a general method to adaptively weight experimental data in the course of structure calculation. It is further shown that the necessity to define weights for the data can be completely alleviated. We demonstrate the method on a structure calculation from NMR data and find that the resulting structures are optimal in terms of accuracy and structural quality. Our method is devoid of the bias imposed by an empirical choice of the weight and has some advantages over estimating the weight by cross-validation. Graf, A., Wichmann, F., Bülthoff, H., Schölkopf, B. A light beam changes direction as it enters a liquid at an angle from another medium, such as air. Should the liquid contain molecules that lack mirror symmetry, then it has been predicted by Fresnel that the light beam will not only change direction, but will actually split into two separate beams with a small difference in the respective angles of refraction. Here we report the observation of this phenomenon. We also demonstrate that the angle of reflection does not equal the angle of incidence in a chiral medium. Unlike conventional optical rotation, which depends on the path-length through the sample, the reported reflection and refraction phenomena arise within a few wavelengths at the interface and thereby suggest a new approach to polarimetry that can be used in microfluidic volumes. Featured highlight ‘Fundamental optical physics: Refraction’ Nature Photonics, Nov. 2006. Conventional nuclear magnetic resonance spectroscopy is unable to distinguish between the two mirror-image forms (enantiomers) of a chiral molecule. This is because the NMR spectrum is determined by the chemical shifts and spin-spin coupling constants which - in the absence of a chiral solvent - are identical for the two enantiomers. 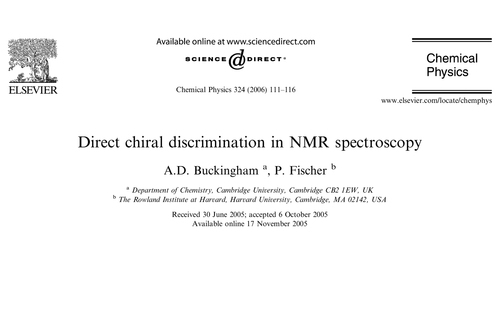 We discuss how chirality may nevertheless be directly detected in liquid-state NMR spectroscopy: In a chiral molecule, the rotating nuclear magnetic moment induces an electric dipole moment in the direction perpendicular to itself and to the permanent magnetic field of the spectrometer. 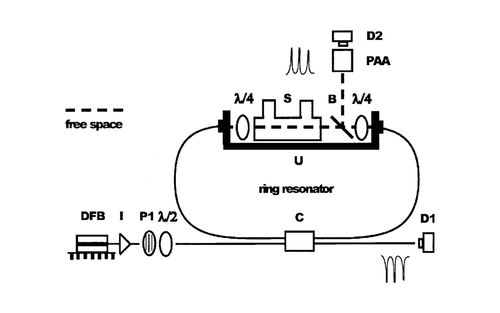 We present computations of the precessing electric polarization following a pi/2 pulse. Our estimates indicate that the electric polarization should be detectable in favourable cases. We also predict that application of an electrostatic field induces a chirally sensitive magnetization oscillating in the direction of the permanent magnetic field. We show that the electric-field-perturbed chemical shift tensor, the nuclear magnetic shielding polarizability, underlies these chiral NMR effects. (c) 2005 Elsevier B.V. All rights reserved. Chiral liquids rotate the plane of polarization of linearly polarized light and are therefore optically active. Here we show that optical rotation can be observed in the frequency domain. A chiral liquid introduced in a fiber-loop ring resonator that supports left and right circularly polarized modes gives rise to relative frequency shifts that are a direct measure of the liquid's circular birefringence and hence of its optical activity. The effect is in principle not diminished if the circumference of the ring is reduced. The technique is similarly applicable to refractive index and linear birefringence measurements. (c) 2006 Optical Society of America. 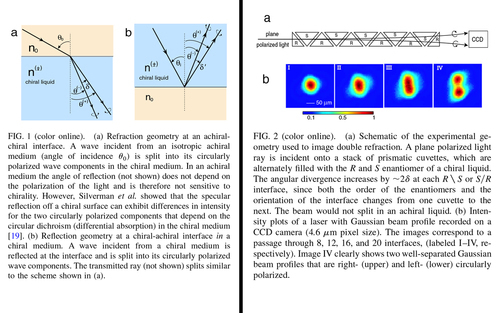 Chen, Y., Fischer, P., Wise, F.
We show how the sign of the refractive index in any medium may be derived using a rigorous analysis based on Einstein causality. In particular, we consider left-handed materials, i.e., media that have negative permittivities and permeabilities at the frequency of interest. We find that the consideration of gain in such media can give rise to a positive refractive index. (c) 2006 Optical Society of America. Vogl, W., Ma, B. K., Sitti, M.
Kwon, J., Cheung, E., Park, S., Sitti, M.
Komelj, M., Steiauf, D., Fähnle, M.
Guo, X., Wang, J. B., Zhang, H. W.
Goering, E., Gold, S., Lafkioti, M., Schütz, G.
Dmitrieva, O., Acet, M., Dumpich, G., Kästner, J., Antoniak, C., Farle, M., Fauth, K.
Baretzky, B., Friesel, M., Petelin, A., Mazilkin, A., Straumal, B.
Zeng, D., Ferrari, A., Ulmer, J., Veligodskiy, A., Fischer, P., Spatz, J. P., Ventikos, Y., Poulikakos, D., Kroschewski, R.
Righetti, L., Buchli, J., Ijspeert, A.
Nonlinear oscillators are widely used in biology, physics and engineering for modeling and control. They are interesting because of their synchronization properties when coupled to other dynamical systems. In this paper, we propose a learning rule for oscillators which adapts their frequency to the frequency of any periodic or pseudo-periodic input signal. Learning is done in a dynamic way: it is part of the dynamical system and not an offline process. An interesting property of our model is that it is easily generalizable to a large class of oscillators, from phase oscillators to relaxation oscillators and strange attractors with a generic learning rule. One major feature of our learning rule is that the oscillators constructed can adapt their frequency without any signal processing or the need to specify a time window or similar free parameters. All the processing is embedded in the dynamics of the adaptive oscillator. The convergence of the learning is proved for the Hopf oscillator, then numerical experiments are carried out to explore the learning capabilities of the system. Finally, we generalize the learning rule to non-harmonic oscillators like relaxation oscillators and strange attractors. Yang, B., Aksak, B., Lin, Q., Sitti, M.
Nain, A. S., Wong, J. C., Amon, C., Sitti, M.
Chou, K., Puzic, A., Stoll, H., Schütz, G., Van Waeyenberge, B., Tyliszczak, T., Rott, K., Reiss, G., Brückl, H., Neudecker, I., Weiss, D., Back, C. H.
Poddar, A., Das, S., Plachke, D., Carstanjen, H.D. Qiu, Y., Gerstel, P., Jiang, L., Lipowsky, P., Pitta Bauermann, L., Bill, J.
Antoniak, C., Lindner, J., Spasova, M., Sudfeld, D., Acet, M., Farle, M., Fauth, K., Wiedwald, U., Boyen, H.-G., Ziemann, P., Wilhelm, F., Rogalev, A., Sun, S.